After a pretty successful first attempt at Camembert, I thought I would try something similar, but a bit more interesting. So I decided to use goat milk and a slightly tweaked recipe. I picked up a gallon of whole pasteurized goat milk. The next morning I heated it up to 76 degrees on the stove, then stirred in 1/4 tsp of Flora Danica culture and 1 drop of rennet diluted in 5 tbls of filtered water. I covered the pot with plastic wrap and left it in a warm spot (~74). By the time I returned home from work that evening it had a thick yogurt-like curd with some clear whey visible. The curd was much sturdier than my previous cheese making attempts due to the longer period of time before cutting it. Instead of putting the draining mats over plates like last time I placed them above small pots so the whey had a place to drain. I used a ladle to scoop the curds into the cleaned and sanitized molds. I flipped the molds every 12 hours for the next two days (after the first 12 hours I moved the mats on top of plates for easier moving), the result was two firm 2 inch thick disks of fresh cheese (the firmer curd resulted in thicker rounds). I sprinkled the entire surface of each round with 1 tsp of kosher salt. After waiting 15 minutes for the salt to dissolve I used a small atomizer to spritz ~1/8 tsp of Penicillium candidum (dissolved in 1 tbls of filtered water) onto the cheese. 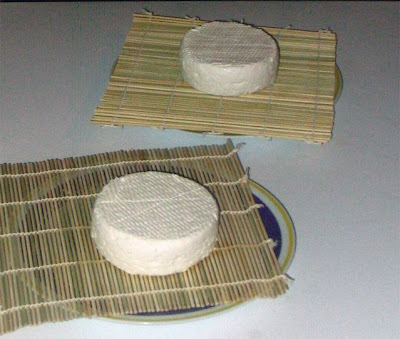 Ideally the cheese should be left to mature in a humid spot at around 50 degrees. Luckily I have a chest freezer which can produce those conditions pretty easily. I flipped the cheese once or twice a day for the next 10 days. Spraying the mold on as opposed to adding it to the milk at the start made for much faster growth than the first time. After 4 days in the refrigerator the cheese has a firm, slightly dry texture. 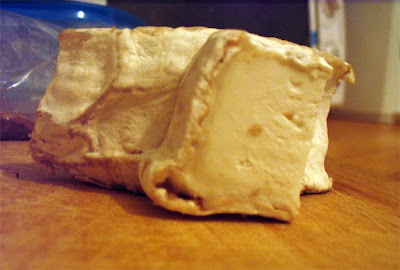 I'm not sure if it was the milk or my method, but this batch has a funkier flavor than the cow's milk Camembert. This batch needs another couple weeks to age (you can just see the mold beginning to ripen the cheese around the edges). Hopefully after 2-3 more weeks the second round will be ripe and ready to try. How do you maintain the humidity in your chest freezer? The cheese looks great! I use a big tub of Damprid which absorbs excess moisture. When that becomes saturated I think I’ll invest in a small battery operated dehumidifier. What you need will probably depend on your chest freezer and your local humidity. Hope that helps, good luck. To maintain humidity in my cheese fridge I use a personal humidifier controlled by a home built circuit that responds to a humidity sensor located inside the fridge. If you want more details write to me.